The 2018 Pathology Horizons Conference was held at the Lough Erne Resort in Enniskillen, County Fermanagh, Northern Ireland. 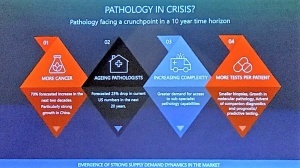 The three-day conference from 13-15th September focused on what the future may look like for pathology, very apt considering the recent consultation “Modernising Health & Social Care (HSC) Pathology Services – Proposals for Change.” in Northern Ireland. The conference gave delegates the opportunity to learn about emerging technologies and cutting-edge research driving pathology and personalised medicine. The event opened with a registration and welcome reception on Thursday evening. Delegates had the opportunity to network and hear first-hand experiences of customers from across the globe who have increased their efficiency and streamlined their operations by implementing one of Cirdan’s imaging systems or their award winning laboratory information management system (LIMS) – ULTRA. Friday morning saw Dr. Hugh Cormican, CEO of Cirdan officially open the conference and introduce our first international guest speaker Dr. Eric Glassy. 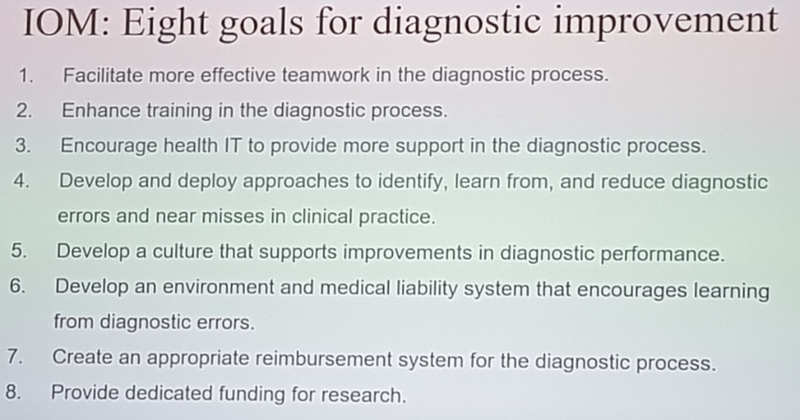 Dr Glassy spoke about the subtleties of formatting diagnostic pathology reports showing how we may communicate consensus of a primary diagnoses and ensure the correct inference is made. This exercise encouraged delegates to think outside of traditional paper copy or electronic reporting, but to a multi-level reporting including imaging, biochemical, consensus reports, and inclusion of hyperlinks/QR codes along with supporting information. Highlighting the need to review current and best practice. Even using the famous Oscar misfortune to explain why layout and format matters. The delegates were then introduced to Dr. Anil Parwani from the University of Ohio, who spoke about the Impact of Digital pathology and Artificial intelligence tools. Dr. Parwani took us on a personal journey of digitising his laboratory. He described the perceived threats and obstacles they faced including validation, regulatory approval, and interfacing. They needed to do a gap analysis of workflow processes, a cost/benefit analysis and manage change process, which lead to successful and sustained change. 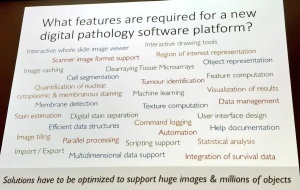 He left delegates with this: “In the future, there will be no digital pathology. It’s all just going to be pathology.” Inspiring this innovation within pathology will transform HSC. Dr. Niamh Buckley from Queens University Belfast (QUB) then spoke to us about some of this innovation taking place on our very doorstep, with her presentation on the “Application of Liquid Biopsy for the Detection and Treatment of Ovarian Cancer.” Dr. Buckley described epigenetic biomarkers, their utility in liquid biopsy, what can be measured and how to find them. She spoke of using circulating tumour cells (CTCs), exosomes, cell free DNA (cfDNA) and circulating tumour DNA (ctDNA). The morning’s session closed with delegates discussing the potential of such diagnostic markers and their ability to screen, stratify, monitor response and assess minimal residual disease. The second session of the conference focused on the development of genomics as a diagnostic aid. 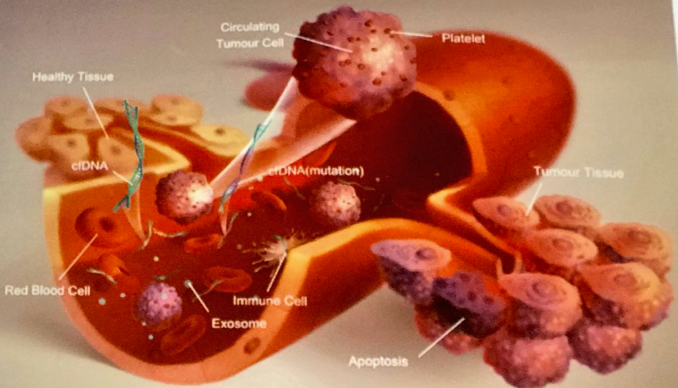 Prof. Jane Armes of NSW Pathology in Australia spoke of genomic sequencing in breast cancer, asking us does it matter what subtype you have if it is triple negative i.e., not expressing ER, PR or HER2 by immunohistochemistry or In situ hybridization. Professor Armes told us why – even in triple negative breast cancer (TNBC), subtyping could lead to personalised treatment. “There has been little application of this refined molecular stratification of TNBC in the clinic, possibly due to inaccessibility of genomic analysis for the majority of breast cancers and the fact that the morphological correlated to these TNBC remain under explored. New technologies, including digital imaging of histology phenotypes, can potentially be recruited to help determine phenotypic subgroups of TNBC relevant to their genotype and therefore their potential targeted therapies. 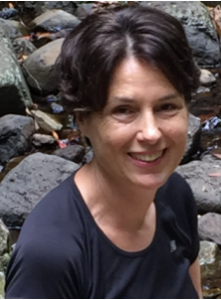 It is possible that these digitally-discovered phenotypes can be applied to stratify TNBC in the routine clinical setting.” Professor Jane Armes. We then heard from Dr. Richard Kennedy from the Almac group and QUB who discussed the “Development of Genomic Assays for Multi-Arm Clinical Trials in Cancer”, describing the complexities and requirements of next generation sequencing (NGS) assays in terms of analytical accuracy, precision, sensitivity as well as their clinical utility. Stating that modern trials look for multiple biomarkes with NGS from a single sample for patient stratification, however the assays are prone to artefacts and analytical issues so would need careful validation. The afternoon sessions began with Professor Deon Venter. Delegates were intrigued to hear of the emerging neuropathology diagnostics. The presentation described predisposing and protective mutations for the development of Kuru and vCJD (variant Creutzfeldt-Jakob disease) both very rare fatal neurodegenerative disorders caused by prion proteins. Delegates learnt of these mutations including codon 129 of PRNP (prion protein gene). 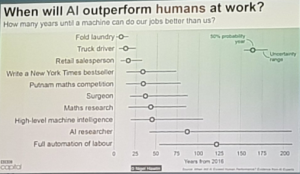 Following which, Dr. Keith Kaplan of tissuepathology.com, USA then spoke on “Artificial Intelligence (AI): what it means for Healthcare and Pathology”. He spoke of the emerging technology hype cycle from technology trigger, peak of inflated expectations, trough of disillusionment, slope of enlightenment and plateau of productivity. 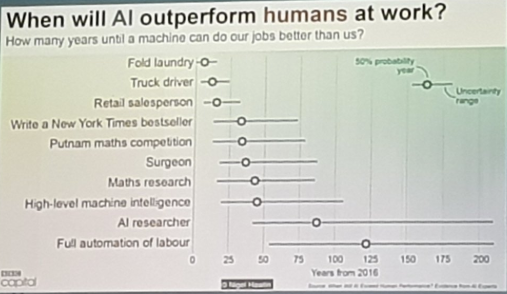 Recounting the applications of AI: how some will outperform humans at work in a few years’ time. Dr. Laszlo Igali then spoke of how virtual and augmented reality might be useful in pathology. Dr Igali explained the difference of these two technologies, describing virtual reality (VR) as a computer generated scenario that stimulates a realistic experience. Whereas augmented reality (AR) as a form of VR that layers virtual information over a live camera feed. He discussed advantages e.g. fast intuitive user interface, fully configurable, no need for lab equipment. Whilst highlighting it was not without its disadvantages including file size, video quality, resolution and social consequences. Dr Igali then proposed the question could augmented reality offer a better solution, and proceeded with a live demonstration of how AR could be applied in a laboratory allowing interactions with the real and virtual environment at the same time. Imagine this in use in an anatomical pathologist’s lab during post mortem or in histology for cut-up. Imagine using AR to perform your tissue measurements, enter patient data and write reports in real time, the future is here now. After a short tea break, we heard from Dr. Peter Bankhead. He discussed what goes into a digital pathology platform when he decided to make his own known as QuPath. 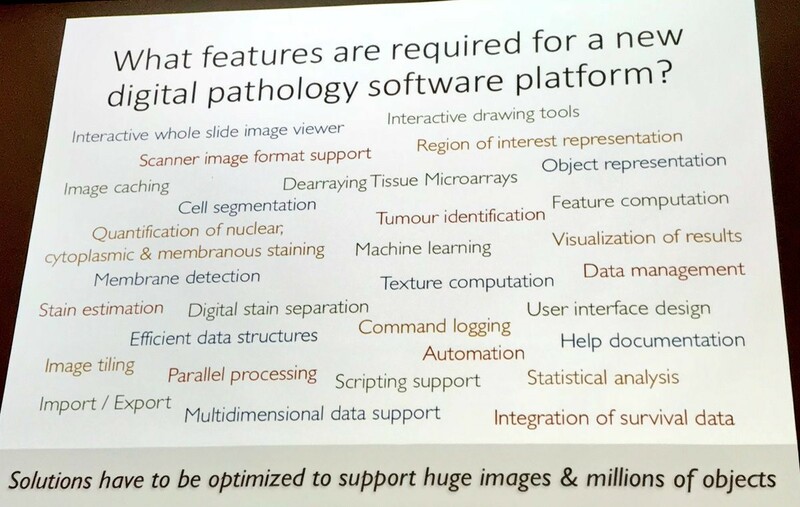 His presentation entitled “QuPath Software: Open Source Software to Reveloutionize and standardize Digital Pathology Image Analysis” really captivated the audience with its potential. Given that, this software is open platform it can be utilised and adapted by the end users to meet their required needs. Dr Bankhead who was previously a research scientist based here in Northern Ireland will continue to build and review feedback received of his software from his new senior lecturer post in digital pathology in Edinburgh. The final speaker of the day was Dr. Richard Levenson University of California Davis, USA who spoke about a new and exciting potential area of diagnostic pathology in his presentation “MUSE: A novel Approach for Rapid Histology“. He describes a novel, fast, inexpensive form of light microscopy for slide-free histology and surface topography from cut surfaces of fresh (or fixed) tissue samples of any thickness. Using MUSE (Microscopy with UV Surface Excitation) he told us of eliminating the requirement for conventional histology processing, formalin fixation, paraffin-embedding, or thin-sectioning. 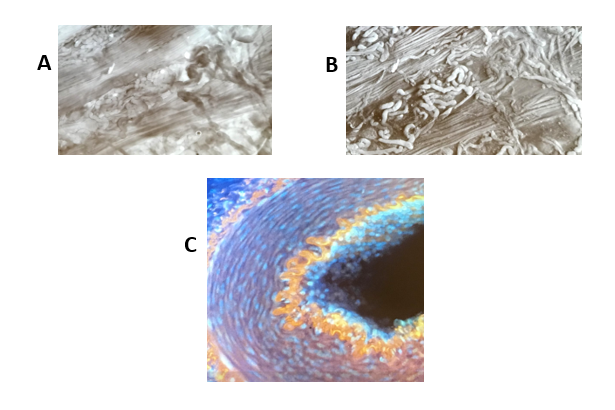 Dr. Levenson described his first experiments in developing this technique in choosing the right light for excitation: A) Blue (405nm) B) Ultraviolet (275nm) in previously frozen lamb kidney. He then continued on to show us the full potential of MUSE, showing us C) a kidney with blood vessel, from a single excitation source – a charged coupled device camera. Highlighting the orange elastic laminae in the artery, the collagen in blue, as well as the green, orange and light blue renal tubules and nuclei. A game changer for histology? – a high resolution, simple and inexpensive form of slide free optical microscopy. Friday evening seen all guests attend the conference dinner where speakers and delegates were able to discuss their innovations, solutions and contribute their ideas. Delegates were able to gain valuable knowledge from the world leading experts, reflect on their current practices and network in a relaxed environment. The final day of the conference saw delegates introduced to David Meade an international business speaker & famous mentalist. David spent the morning challenging delegates to think differently about their business and decision making interactions. Offering them a practical transferable toolkit to improve decision-making, drive, ownership and accountability whilst also developing leadership and motivation skills along the way. Irene Regan Past Vice-president of the Academy of Clinical Science and Laboratory Medicine Ireland gave an outline of current value driven offerings within pathology including test ordering and utilisation, facilitating comprehension and diagnosis in test reports, avoiding diagnostic error, condition or population management and digital pathology in her presentation “Laboratory Medicine: The Times They Are A Changin”. She also proposed a value cycle, to quality improvements which took the form of the acyronym SCIENCE. Dr. Dean Wallace, University of California Los Angeles (UCLA) then presented a potential opportunity in forming a coherent diagnostic message for any given case, through integration of pathology and radiology. 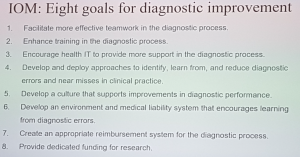 What are the benefits of integrated diagnostic reporting (IDR)? Dean Wallace shared his experiences citing numerous opportunities for improved workflows and patient outcomes. 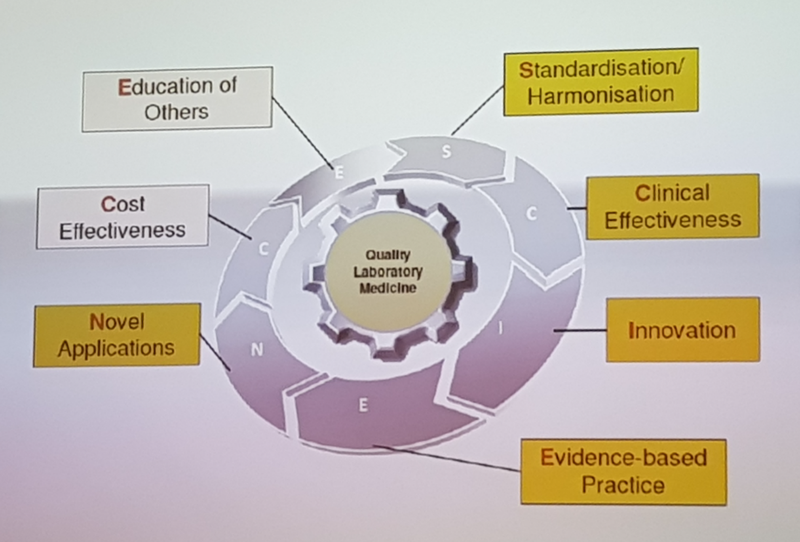 Using his eight goals for diagnostic improvement, both departments benefited from increased collaboration and experiential learning as well as easier/quicker contextualised communication across the clinical setting. Patients benefited from shortened time from diagnosis to treatment and improved diagnostic accuracy (after successful implementation and feedback). Is there potential for further integration or shared learning across diagnostics? The final speaker Dr. Donal O’Shea also spoke of an opportunity highlighting the application of AI in screening processes in pathology, in his presentation “Finding Normals”. He proposed a generalised model for abnormality detection to help identify abnormal content of interest and support the elimination of normal cases from the workflow. Then asking should pathologists be worried about losing their jobs to technology? Dr O’Shea said the answer is quite the opposite – it might be hard to keep up with the incoming increase in workload. 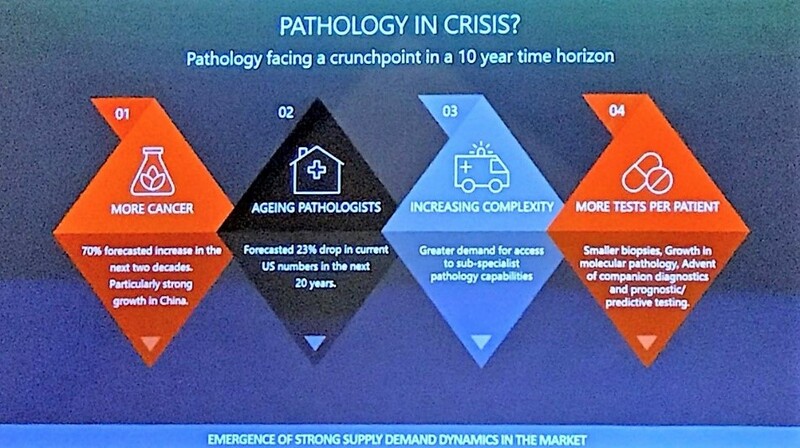 This for a number of reasons; more cancer, ageing pathologists, increasing complexity and more tests per patient. Leaving us with the feeling our jobs within diagnostics will be secure for the coming years. Leading us to a high point on which to close the conference. 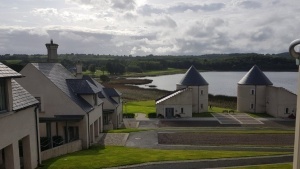 Elaine Armstrong, Head of Marketing, Cirdan gave then the closing remarks on what was a tremendous conference, with many high calibre speakers. She thanked the invited guests, delegates and speakers for sharing their experience in this unique format at Pathology Horizons 2018. However, the conference did not end here Elaine detailed how Cirdan had also given the delegates an option to partake in a choice of conference activities in either a round of golf on the Nick Faldo course at the Lough Erne Resort or a trip to the Marble Arch Caves, giving details of the arrangements. Opinion: Overall, a valuable conference. From the ability to network, develop knowledge, socialise and be at the forefront of technology. I believe the team put on a great programme of activities. Giving delegates a lot to reflect upon and either bring back new approaches or enabling them to discuss the potential future applications for their laboratories. 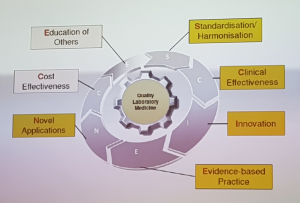 I felt that by attending this conference it broadened my horizons, giving food for thought, in terms of research, academia, private enterprises and their potential to integrate further with the health and social care clinical laboratories. It has opened my eyes to the vast array of jobs that one can pursue in the field of biomedical science, from clinician, academic, researcher, product design to leadership and management. I have learnt that extensive knowledge cultivated within HSC can enable you to pursue further private ventures. Having never heard of a job role described as a Subject Matter Expert (SME). I learnt of their role in providing support, installation and business improvement projects, improving efficacy and quality across the healthcare setting. Article written by Glen McDowell, Advanced Biomedical Scientist, Belfast Health and Social Care Trust and Secretary of the Institute of Biomedical Scientists (IBMS) Northern Ireland Branch.